The thing I love most about the Harbor Park, however, is the hammocks. There are a few dozen of them, strung up in the trees alongside Columbus Boulevard beneath a canopy of colored icicle lights. They’re huge—you can get three or four people in them if you do it right—but they’re still a very hot commodity. I’ve been trying to get a hammock all summer but they’re always full, especially on the weekends, so for the past few weeks, I’ve been consoling myself with overpriced drinks. Last Thursday, however, I decided enough was enough. “I want a hammock,” I told The European. “Well, can’t we just… you know… stare at people until they get out?” There was a little kid in a hammock just a few feet away. He looked like easy prey, plus it was past his bedtime. But he was just toying with us, jumping out of his hammock to play with his flip flops and then jumping right back in. But I was not to be cajoled into giving up so easily. I, you see, have been training for this sort of thing. It started last year when I went on a cruise with my ex-boyfriend and his family. I was none too thrilled to be cruising Carnival (I’m a Royal Caribbean gal) and I was even less thrilled to be cruising in July when every child in the Western Hemisphere decides that their sole purpose in life is to run amuck through the ADULTS ONLY spa, thereby disturbing the peace and tranquility that 20-something women and their 30-something boyfriends are trying to enjoy. The one good thing about Carnival, however, was that said spa had these amazing, bed-sized lounge chairs. They were black and teal and the moment I laid eyes on them, I knew that I had to have one. Preferably for the duration of the entire cruise. But to get a bed-sized lounge chair requires dedication. You need to get up early, go to the gym, eat breakfast, shower and find yourself a seat by like 6:00am, or else you’re screwed. The alternative (for those of us who don’t ever get up early or go to the gym) is to take a team approach. One member of the team stakes a claim while the others gorge themselves at the buffet, then you switch, but this approach really only works if you’re part of a very large (in every sense of the word) family reunion. He always looked a bit embarrassed in those moments but not too embarrassed to settle down and enjoy the fruits of my labor. It all comes down to the powers of observation and analysis really, just like when you’re trying to catch a bus. You can’t see around the corner to know whether or not the bus is coming but you can see the people waiting for it. When they start getting shifty, it’s time to run. 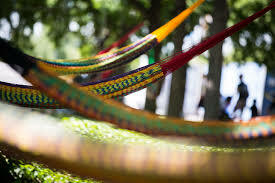 And the same thing goes for the hammocks at the Harbor Park. Shortly before midnight, we finally got one. And it was every bit as delightful as I imagined it would be: breezy and cocoon-like and the perfect hiding spot for making out in public (not that I would know anything about that). Eventually I fell asleep snuggled up on The European’s chest and before long a park guard was shining her flashlight into our little nest telling us it was time to go home because the park was closing. As we joined the stream of other couples stumbling from their hammocks and making the mass exodus back towards the city, I felt a surge of triumph, the same sort of triumph I feel when I manage to actually close down a nightclub (which isn’t all the often). I got a hammock. And we stayed long enough to get kicked out. Take that 29! They just added a new perk to the Diamond level where every night for happy hour (like 6-9) you get 3 complimentary drinks at any of the lounges automatically added to your seapass card. Motivation to keep cruising!! Or at the very least, you could introduce the European to the epic game of Secret Agent. or caroling in front of a whole cruise full of people. Whichever. LOL You are my daughter for sure, no babies were switched at the hospital 😉 Between the chauffeur’s competitiveness and my ability to get my share of “free” things, you held onto the family honor! Omg, omg, omg. This is in PHILADELPHIA?! Why didn’t I know this? It sounds awesome!! What else is there in the city that I am unaware of!? They’ve extended the opening til the 28th. Go! !